Vienna boasts Europe’s largest indoor tennis hall: 13 tennis and four badminton courts, all under one roof, invite the enthusiasts of net ball games. Renovating the surfaces of facilities of this scale is a mammoth task. Professionals are required here – amateurs are out of their depth: The Sportbau HL specialists, hailing from Gunskirchen in Upper Austria, laid an impressive 8000 square metres of needle-punched flooring in this hall, built in 1985. This XXL project was completed in just under two months, from early July to the end of August 2015. This double with STAUF playing against time finally ended in game, set and match for STAUF. It is a sweltering early midsummer afternoon. The sun is beating down through the skylights and onto the tennis courts: The hall inside is only slightly cooler than outside. The thermometer reads 36 degrees. The five Sportbau HL floor-layers are perspiring already: Some have rid themselves of their T-shirts and are working bare-chested. The site radio is blaring pop music – right now it is Uncle Krackers “Follow me”. “Turn the sound up!” shout two workers busy sanding the filler in a corner of the hall. Music tends to speed up the process. The floor-layers have put in some hours of preparatory work already: The old flooring had to be ripped out and the floor sanded down. Completely new sports flooring was called for – not a shred of the old flooring must remain. The experts opted specifically for STAUF D 54 for floor undercoating: The adhesion and priming concentrate has a very high coverage and is quick-drying – important properties for such large areas and tight schedules. D 54 also contains no solvents and has very low-emissions – another important argument here, considering that the floor-layers will spend many working hours in the closed hall. The pallet with SP TEXTILE dispersion adhesive is waiting at the centre of the hall, ready for use. Large rolls of green needle-punched flooring and the rollers are ready nearby – the floor-layers will need these later to ensure that the sports flooring is securely glued down full faced. 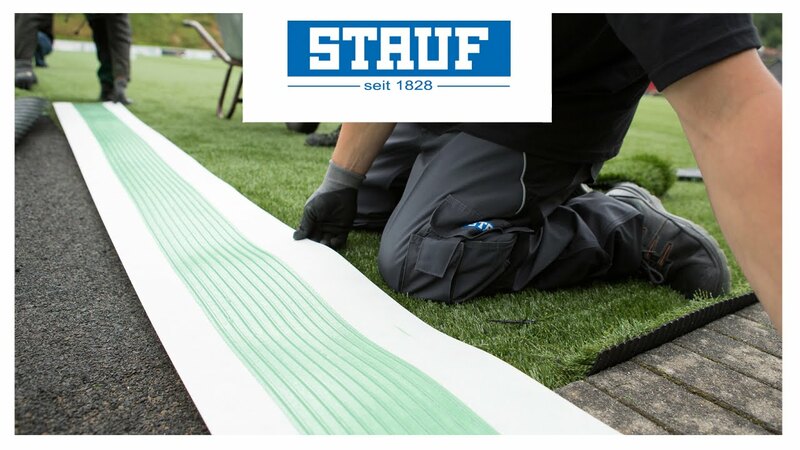 Whilst the filler is still being sanded down in a corner – some 30 square meters needed touching up with the durable filling and repair compound STAUF RM – two Sportbau HL staff have already started laying at the centre of the hall: The green needle-punched flooring is securely glued down with STAUF SP TEXTILE. This dispersion adhesive is particularly suited to textile sports flooring. It was developed for a long service life, especially under high stress; with the hard adhesive groove also reducing seam shrinkage. “Apart from this, SP TEXTILE will strongly adhere right from the start, to make laying easier”, explains floor-layer Siegmund Zotter, taking a big gulp from his water bottle before continuing. Voices are coming from a few courts away, with every now and then the thunk of a hard serve – business will continue as usual, since not all the courts are being renovated simultaneously. The floor-layers from Gunskirchen are not distracted at all. One of them is busy recessing the needle felt on an almost completed court, for marking the field: The material for the white lines which the tennis players will, of course, need for orientation, is prepared already - on rolls. It will later be cut using a dual blade knife, before bonding them into place. Yet a lot of sweat is sure to be spilt before all the courts are renovated. But one thing is for sure after completion of the renovation phase: Great tennis. And with STAUF as the reliable partner, the floor-layers from Upper Austria will keep their eyes on the ball.